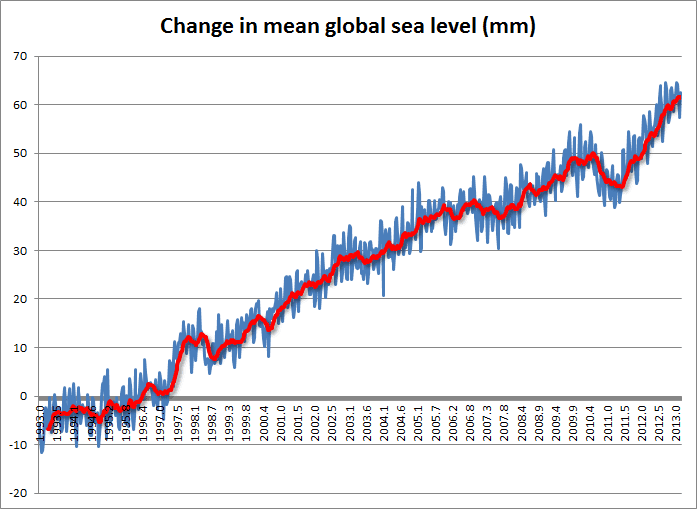 July 16, 2013 at 8:30 am Shouldn’t melting sea ice lower sea level? July 16, 2013 at 8:45 am Aren’t the NASA ICESAT satellites newer and show a net gain of ice on Antarctica? The study looking at both GRACE and ICESAT sure interpreted a net gain. I’d hope these researchers are familiar with that study. July 16, 2013 at 8:27 am If all this glacial ice melt from Greenland and the Antarctic continent at the south is acceleralting so much, how come sea level rise has slowed down so much? Where is all the water going? Massive inland lakes are not increasing. In fact in areas of rapidly increasing local populations, such fresh water sources in some regions are becoming much smaller. So if the 99% of the ice cover which could increase sea levels, really is melting at an increased rate, surely the rate of sea level rise should be accellerating, but it is not. Why not? 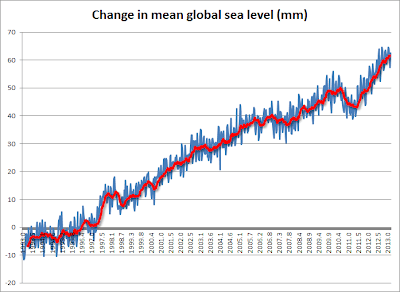 Here is a chart showing the rise in sea level, which is currently around 3.2 mm a year. It's speeding up not slowing down. Update: Anthony has a new article about another study on ice sheet melt. He talks of "quantifying numbers" and doesn't know the difference between determining the rate of melt and the total melt for a given temperature increase. Shouldn’t melting sea ice lower sea level? That's a black mark for Dave's primary school, then.